Hitting shots out of the sand in Golden Tee is really not that difficult. The game will tell you how far your ball will go with the club you have selected, so there’s not much difference in gaging distance from this shot and a fairway shot. 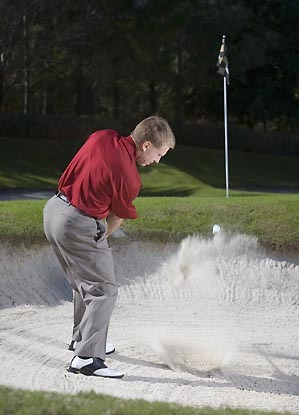 The punishment is the distance you get out of this sand shot as compared to a fairway hit. The one big tip here is that you won’t be able to get much backspin on this shot in Golden Tee, so you can’t fly the hole and expect the ball to back up towards the pin. Playing out of thick rough in Golden Tee will certainly take a chunk out of your distance, as it should. As always, a good tip is to gauge your distance from the club that Golden Tee recommends you hit, and then adjust accordingly. Remember that you cannot generate as much backspin when hitting out of thick rough! 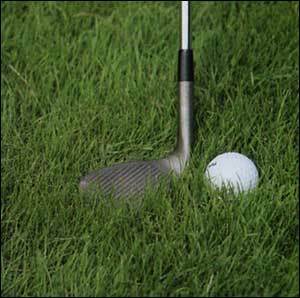 Another important note is that if you try to hit a big A1 or B3 out of the rough, you will actually LOSE distance! Your ball won’t hook as much either. So, keep this in mind if you’re planning to hook a driver out of the rough to gain distance in Golden Tee, because you’ll actually lose 20-30% of the distance off a straight shot! Snow shots are unique enough to warrant a separate discussion in Golden Tee. With the introduction of the 2008 courses, in particular the course Summit Lakes Country Club, you can land your ball on ice or snow! Hitting off ice is similar to hitting off pavement or rocks (see “Other Various Lies“), but snow is a bit different. First, if you’re unfortunate enough to land in the snow in Golden Tee, you’ll notice the ball just stick and get buried. That’s realistic, so kudos to Golden Tee for capturing that. There’s no roll to be had through the snow…wherever it lands, it stays, thus costing you distance. So, a good tip to consider when flirting with the snow is whether or not you’ll be able to get to the green in your next shot if you do land there. In most cases, you won’t be able to advance the ball very far. Snow really seems to take a lot of distance off the shot, and it should. 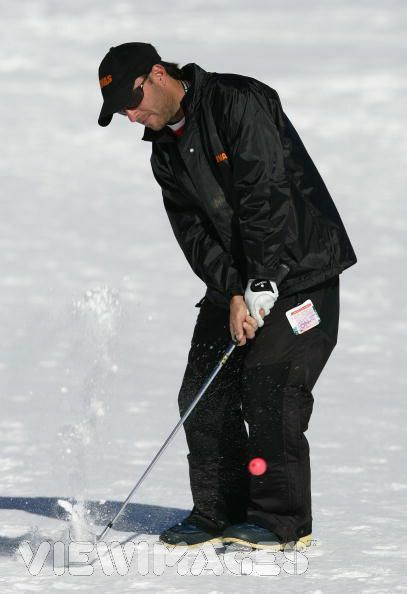 Be prepared to get only about 50% distance on your next shot if you plop one in the snow! It is possible to slowly roll the ball into the snow and have it sit up more, similar to sand. I had a ball roll down a hill into snow, and I ended up with a decent lie. It’s best to assume that your ball will end up buried though if you plan on flirting with the snow in Golden Tee! During the course of a round of Golden Tee, you’ll find yourself on top of all kinds of other various lies too, such as pavement, cart paths, rocks, ice, and hardened lava. You’ll notice that you lose some distance when having to hit from these lies, and as with other situations, you won’t be able to backspin the ball very much. A good tip is to gauge the distance from what club the Golden Tee game recommends you hit, and then adjust for wind and slope before your shot! UPDATE — In Golden Tee 2009, get ready to hit out of mud and tall grass! I’ll size up these lies after I get some experience hitting out of them!